Outstanding efficiencies, and an impressive viewing area make Timberwolf® stoves a perfect choice. The Economizer™ EPA 2200 Wood Stove provides an efficient wood burning solution for heating your home. The Economizer™ EPA 2300 Wood Stove, the largest in the series, provides a high area heat service. The EPI22 is an efficient, and clean burning heating source. 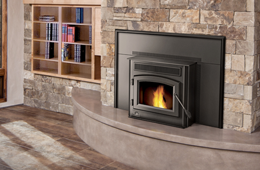 Transform your masonry fireplace into an efficient, pellet burning heat source.